The last few days has seen intense work on Kaffe Matthews’ Ghent Bicycle Opera which goes live in a few days, lots of new stuff on the git repo for Beagle Board/GPS powered sample playback. The main problem with the version we tested in June was that all the samples needed to be preloaded, fixing us to <512Mb total sample data. The sample loading was also extremely slow, meaning it could take up to 10 minutes after starting up till the bikes were usable. This slowness turned out to be uncompressing the ogg samples into memory on the not so fast ARM processor. Seeing as they needed to be entirely uncompressed to play anyway, there was little point in compressing them (we have no shortage of storage memory on the SD cards). Now the zones (which link areas of the city to audio samples) are surrounded by a couple of hundred metres of loading/unloading area - crossing into this area causes the sample to start loading, exiting frees it from memory. We can now fit all samples for all the routes (collections of zones for different parts of the city) onto a single system - much more than the total memory on the boards. 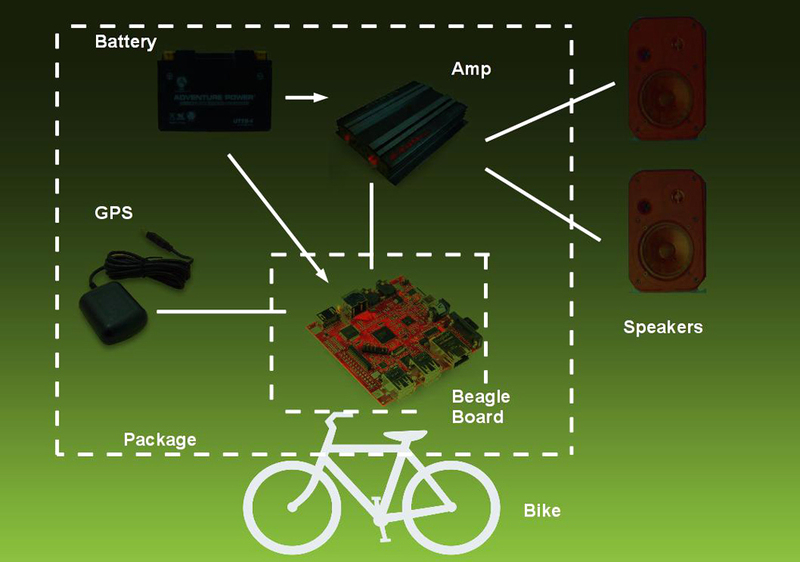 Other significant improvements include a more data-driven sample playback, where zones are given a naming convention that describe if the sample needs to loop, be panned to come from a specific compass direction (based on the calculated direction of the cyclist, from GPS data) of if they need to be a special mysterious type of zone - called a "ghost zone". Ghost zones are programmed to travel across the city over time - blending between a start and end shape/position, so in the morning they might be heard in different places to the afternoon. You'll be able to experience The swamp that was, a bicycle opera at Electrified III: The Responsive City, in Ghent from this weekend.